This being the first open meeting of the year, many were put off by the forecast, whilst many other open meetings were being cancelled it looked like we were going ahead. On arrival there was a lot of coffee drinking and not many boats being un covered, it was a far cry from the recent World Championships in New Zealand, both in temperature and wind strength. After the realisation that the race committee were serious about going sailing boats were quickly rigged and brave souls changed. Neither Dave or Burt had a watch between them so Burt found himself in the unusual position of starting near the Committee boat listening out for the countdown. Meanwhile Chris was looking to occupy Burt’s normal position of ‘tacking the pin’…Sadly for him that resulted in being ran over by a National 12 trying to make it down wind to the starting area and subsequently missing the start. Only three boats managed to clear the start line and on completing two round of a triangle course Burt finished ahead of Dave with Deryck finishing in third. The second race the breeze was now really blowing. The start was much the same with Dave, Burt and Deryck starting at the Committee boat, with Chris again looking for the pin start. This time it paid off and Chris set off on Port to clear the others and to never be caught. 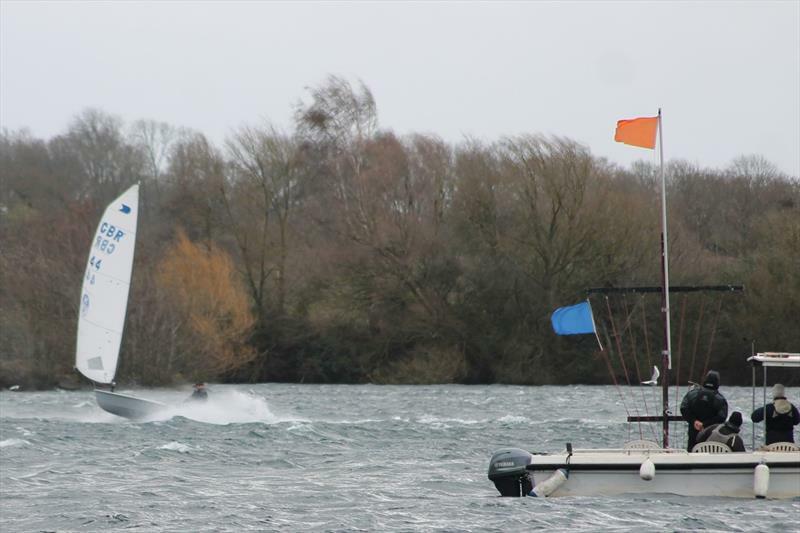 On the final round, the wind now gusting up to 38 knots, even the ‘big man’ Burt was knocked flat on the final reach to the finish line but still recovering from a couple of flips to come home second. The ever consistent Deryck again finishing third. 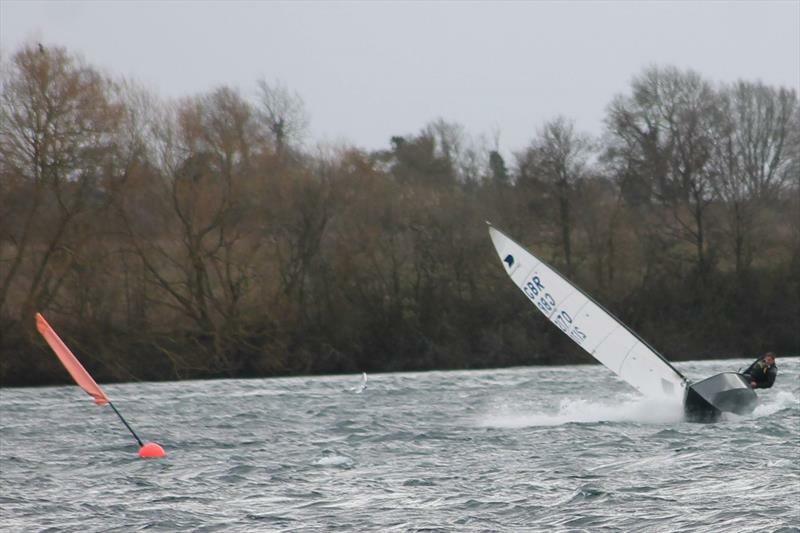 With the wind now at the top end for racing OKs (F7 gusting F8) was abandoned for the day. So, much like the recent Worlds Burt did only manage to win one race (in case you hadn’t heard yet) but this time he did win the event, Deryck with two thirds finishing second overall, complete with battle scars and Chris rounding out the podium in third. 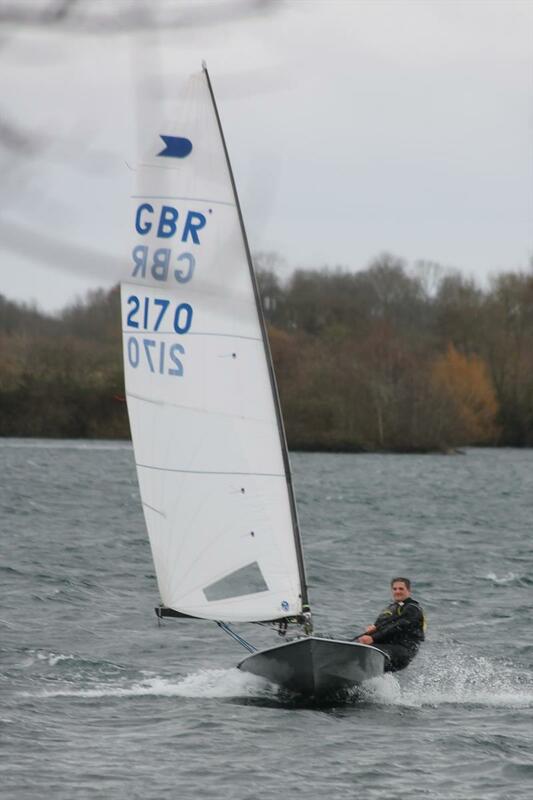 Burghfield Sailing Club laid on a great event both on and off the water and we all went home with smiles on our faces.